The elections are over. Winners have been congratulated, losers have been consoled. It’s time to relax. WRONG!! There are all these campaign buttons that need identifying. Every so often we come across campaign buttons for candidates we’ve never heard of. How do we identify who they are? And when we see a “Smith for Congress” or a “Jones for Senator” button, well, how do we know which Smith or which Jones? That’s where you come in. We’ve been offering photos of these unknown buttons (arranged alphabetically by candidate names) for you to help identify. And you’ve done an amazing job. (Previous “Who Dats”: Unknowns beginning with the Letter A, Letter B, two pages for Letter C (here and here), Letter D, Letter E and Letter F.
And now we’re back with another selection of campaign items of candidates, this time focusing on the letter “G.” As in, G Whiz, who the heck ARE these guys?? 144 = Gross. Nelson or H. R.? I don’t think either; I think the button is much later since the last time Nelson (1970) or H.R. (1972) ran. Could it be Doug Gross, then? He was the GOP nominee for Governor of Iowa against Vilsack in 2002. “Go with Glenn” possibly refers to John Glenn, who was elected several times (having lost once in a primary) to the U.S. Senate from Ohio, serving for 24 years. Since 144 = 1 gross, “Vote 144” likely references 13-term Congressman H.R. Gross of Iowa, who delighted in introducing House of Representatives bills numbered “H.R. 144”. Douglas, the Glenn button has a Pittsburgh address on the curl, so I’m thinking it’s a Pennsylvania item. Also, I don’t think this is an H.R. Gross button, or a Nelson Gross (N.J. GOP Senate candidate 1970) item either. No, this button is much more recent than that; probably 1980s or so. 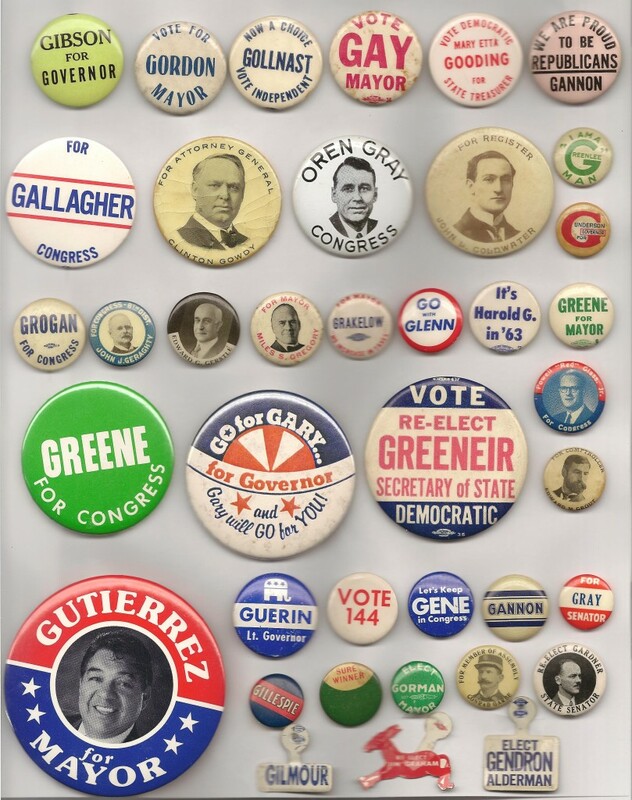 The “Guerin Lt. Governor” is for John Guerin who was on the 1976 Republican ticket in Rhode Island. He lost to Thomas J. DiLuglio (Democrat). “I am a Greenlee man” — Pleas Greenlee, executive secretary to Indiana Gov. Paul McNutt, was a candidate for the Dem gubernatorial nomination at the 1936 state convention. (See Wm. Franklin Radcliff, Sherman Minton: Indiana’s Supreme Cpurt Justice, pp. 36-37, 64-65.) I don’t know if he ever ran for anything else. “Gibson for Governor” — This last one’s a pure guess. Ernest W. Gibson was elected Governor of Vermont in 1946 and 1948, serving until 1950 when Truman appointed him to the Federal bench. Oren Gray challenged incumbent Rep. Myron George in the Kansas 3 Republican primary in 1956. He lost. (See “Close Battle Waged for Fifth District Congressional Seat,” Lawrence Journal-World, 8/8/56, p. 5. http://news.google.com/newspapers?nid=2199&dat=19560808&id=JgdGAAAAIBAJ&sjid=X-oMAAAAIBAJ&pg=6986,2406175 ) He later served as a state representative, 1965-73.